Yuli Borisovich Bryner was born in Vladivostok, Primorskaya Oblast, Far Eastern Republic on July 11, 1920.The son of a Mongolian mining engineer and his Romanian gypsy bride, Brynner became at age 13 a nightclub balladeer and then a circus acrobat in France. An accident cut short his career on the trapeze, however, and by the early 1940s he had drifted into acting with a touring company. He made a successful Broadway stage debut in 1946, playing an Oriental prince in Lute Song. He then worked as a television director from 1948 until 1951, when he was offered the role of the king of Siam in the Richard Rodgers and Oscar Hammerstein musical The King and I, for which he won immediate acclaim. He gave 1,246 performances as the king on Broadway from 1951 to 1954 and then starred in the screen version of The King and I in 1956, winning an Academy Award for best actor for the role. He went on to give a total of 4,625 performances of the part, taking his last curtain call as the Siamese king in 1985. 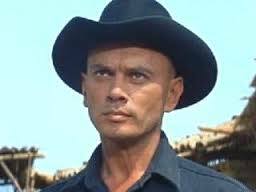 Brynner also had starring roles in such major motion pictures as “The Ten Commandments” and “Anastasia” (both 1956), “The Brothers Karamazov” (1958), and “The Magnificent Seven” (1960). Brynner died from lung cancer in New York City, New York on October 10, 1985. BRYNNER, Yul (Yuli Borisovich Bryner) [7/11/1920, Vladivostok, Primorskaya Oblast, Far Eastern Republic – 10/10/1985, New York City, New York, USA (lung cancer)] – model, musician, singer, producer, director, stage, film actor, photographer, married to singer, actress Virginia Gilmore [1919-1986] (1944-1960) father of Yul "Rock" Brynner II [1946- ] father of Lark Brynner [1958- ] with actress Frances Martin (Franziska Steinbrecher) [1939- ], married to actress model Doris Kleiner (1960-1967) father of business woman Victoria Brynner [1962- ], married to Jacqueline de Croisset (1971-1981) father of adopted daughter Mia Brynner [1974- ] father of Melody Brynner [1 975- ], married to actress Kathy Lee [1957- ] (1983-1985).